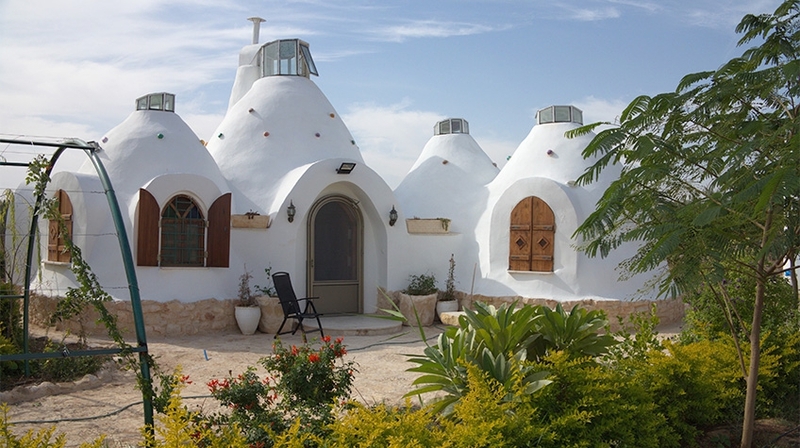 Recently, I came across an article about an architectural firm designing earthships for Palestinians, which is a great idea! ShamsArd (litterally Sun and Earth) is the Palestinian studio which worked on the Moon Cocoon eco house project (photo above), a cheap and environment-friendly home made of local and raw material, based on how people used to build houses centuries ago, before the concrete revolution. The thing is whenever I think about those who are home-deprived, whether it’s because of war, climate, or economic reasons, I wonder why eco houses are not the first solution to pop into our politicians’ and governments’ minds, especially as they’re cheap and environment-friendly? Why are we always fighting for an apartment in a concrete building in the city? Why are we fighting to get ceramic toilets from a great brand, or an electric oven? While some people are turning their lives upside down by choice, others strive to get what these same people had. Why is that? In our consumerist world, the standard living became having a home made of cement with a full equipped kitchen and ceramic bathroom. How did we come to that? I’m not saying we shouldn’t have the necessary home tools to live in a dignified way, I’m just saying how come we all want the exact same things from the exact same brands ruling over the world (and our lives)? Let’s just break this “standard” and say we can use everything our environment gives us, exactly like our ancestors. This will definitely put an end to homeless (and some of the environmental) problems. Having a home made of concrete doesn’t resolve everything, comfort and dignity do. Let’s think about it: when we have a house made of mug with an oven made of clay, and everything works out for the best, what more do we need? When there are people building hobbit houses or earthships and living in it happily, why would the people needing homes wouldn’t? Plus, educating people in how to grow their own food in their yard or on their balcony could help so much too. There are countless solutions laying there in front of us. Let’s take them and be an actor instead of counting 100% on governments’ help that won’t or can’t entirely fulfill their promise. As Ahmad Daoud, the architect in charge of the Moon Cocoon project says, Palestine relies on international aid to survive, but his aim is to achieve some independence. Fortunately, some of the means are there. The designed house looks lovely and would suit any person’s needs. With the migrant crisis in Europe, earthships like the ones our Garbage Warrior built for climate refugees in Indonesia could come in handy, especially with winter coming. Germany is burning thousands of fuel and money for inefficient hot air heating in refugee camps (all the tents cannot be heated). I wrote ‘burning’ because the cost is big humanly, environmentally, economically. Imagine if the camps were all eco houses, built to suit the refugees’ needs at a very low price? Wouldn’t that be a win-win situation for everyone? Ecology is not a political movement, it’s a lifestyle that respects our environment and our human condition equally. Eco-living takes into consideration that the living (human, animal, plants) are all united, as long as a natural cycle is respected, so are our lives along with it. Remember that “the world has enough for everyone’s need, but not enough for everyone’s greed” (Gandhi). Eco houses images source: Inhabitat: 6 Eco-Friendly DIY Homes Built for $20K or Less! Posted in consumerism, great impact, lifestyle, sustainable houses, they did it for real!